Now, there has been much confusion as to whether or not a deck and a patio are the same. Here are the major differences, so you can properly go onto how you can build a deck. Patios are a Spanish concept. In fact, the term itself is Spanish, and denotes a courtyard for a house or any similar structure. However, a patio is very much different from a courtyard, in the sense that it does not need to have walls or structures around it. It’s the same as a courtyard, in the sense that it is next to a structure, but it is not the same in the sense that it is not surrounded by walls. Patios are designed with the landscape in mind, and are usually made of a variety of materials, like stone, tile, brick, and others. Patios are usually on the ground level, if not slightly raised or lowered, so they don’t need safety rails. 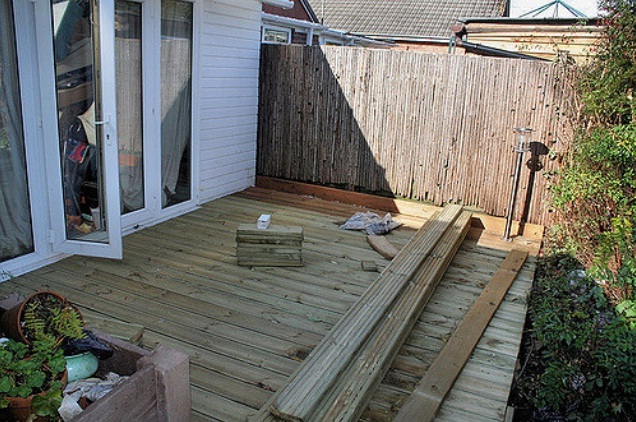 Most decks use pressure-treated wood on the visible parts, such as the decking itself, the benches and structural parts. However, many decks which utilize pressure-treated wood lose their luster after a certain period of time. The wood either splits or turns into an ugly grey, which might not look good after some time. This should not worry you because a little care here and there can go a long way into making sure that your deck looks great at all times.